So I'm probably the last one on the bandwagon here, but I've been powering through the Man Men DVDs and I'm totally OB-SESSED with the show. I knew there was an upcoming season, so I decided to use the summertime to catch up on the older seasons to be a part of the craze (it makes me crazy when I'm not crazed for a TV craze - Glee, you may be next). I love it for a multitude of reasons...and here are some of them... 1. It is a "period piece" (a cinematography term that brings manfriend major giggles). I love when movies/tv are set in another time. The costumes are amazing. The clothes - gorgeous: 2. The 1960's culture. 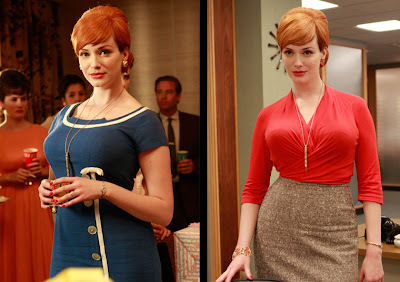 The interesting thing about Mad Men is that they smoke, drink all day, are sexist and totally say all the things that grandparents sometimes blurt out forgetting they live in modern times. It's kind of jarring at times, but an interesting look at how people lived then. It's also chaulked full of historical tidbits that the nerd in me goes totally gay for. Here they all drinking and smoking it up in the office: 3. 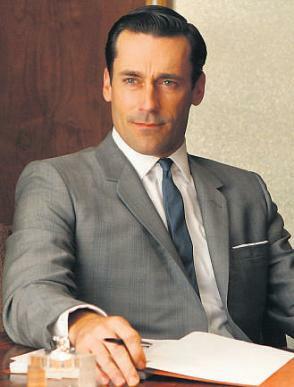 John Hamm. He plays the main character, Don Draper. While he's super dreamy, he's kind of a scum bag. I constantly can't decide if I love him or hate him. You want to root for him, then he goes an does another scummy thing. But then he's so dreamy. 4. January Jones. She plays Don's wife, Betty Draper. She is a restless housewife to the max. She portrays the character with so much depth its just stupid. And, I have a major girlcrush on her. 5. But more than I love Don or Betty, I love their power couple-ness: 6. Ensemble cast. There are so many characters, you can't really get bored. Every single one of them has their own storylines and is interesting in their own right. That's probably more about the genius writing. I love it. There's a cool thing here. It's called "Mad Men Yourself." You can make yourself into a 1960's-era character. Here's me: All in all, its just awesome. The 4th season is about to commence, and I'm halfway through the 2nd. I'm going to have to get movin'. If you haven't checked it out, DO IT. Love, love, love, love, love! Amazing storyline, great characters, FABULOUS COSTUMES. I'm going back to the 50's ASAP.